The fourth annual Lismore tasting, pitching South Africa against the rest of the world, focused on wooded Sauvignon Blanc and white Bordeaux blends. In previous editions we have looked at Syrah, Chardonnay and Pinot Noir. The Cape has always held its own at Lismore, but this year’s tasting was a veritable triumph. Of the 13 top wines chosen by the group, 12 were from South Africa. The only other wine was the Chilean Sol de Sol. My own favourites differed slightly, including two New Zealand wines, but otherwise there was a large degree of cross over with the results of the group, as well as with my 2017 South Africa Special Report. It is true that South Africe enjoyed a numerical advantage, with 27 of our 41 slots, but the non-South African wines included many top producers from France and New Zealand, as well as representatives from Argentina, Australia, Chile and Spain. 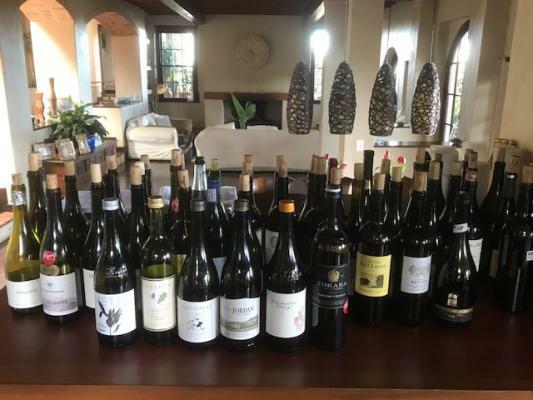 In an ideal world, we would also have included a wine or two from Austria (three samples are stuck in customs in Johannesburg) and Italy, but it was still a strong group of wines, at least on paper. The French wines were especially disappointing, not least a bottle of oxidised Domaine de Chevalier, which was the most expensive wine in the tasting at over £100 a bottle. (I know, because I bought it two weeks ago). South Africa did brilliantly, which makes me wonder why the variety isn’t taken more seriously. To many Cape producers, basic Sauvignon Blanc is a cash cow, sold young, quickly and profitably. The best examples, most of which are wooded, are far harder to shift. But having tasted at the Nederburg Auction pre-tasting last week, I can confirm that it’s a syle that ages very well indeed. South Africa should make more of the style. Hopefully, this set of results will be a springboard to greater things. Alphonse Mellot Le Manoir, Sancerre 2016 (FRANCE); Château Reynon Sauvignon Blanc, Bordeaux 2016 (FRANCE): Colomé Lote Especial, Altura Máxima, Salta 2017 (ARGENTINA); Constantia Glen Two 2016; Cullen Sauvignon Blanc/Semillon, Margaret River 2016 (AUSTRALIA); Dagueneau Blanc Fumé de Pouilly 2013 (FRANCE) David Nieuwoudt The Bowline 2016; Diemersdal MM Louw 2016; Diemersdal Wild Horse 2016; Domaine de Chevalier, Pessac-Léognan 2011 (FRANCE); François Cotat Les Monts Damnés, Sancerre 2015 (FRANCE); Gabriëlskloof Magdalena 2016; Klein Constantia Perdeblokke 2017; Le Petit Haut-Lafitte, Pessac-Léognan 2015 (FRANCE); Lismore Barrel Fermented Sauvignon Blanc 2016; Morgenster White Reserve 2015; Reyneke Reserve White 2014; Saltimbanco Sauvignon Blanc, Uco Valley 2016 (ARGENTINA); Shannon Capall Ban 2016; Steenberg Magna Carta 2016; Torres Fransola, Penedès (SPAIN); Viña Leyda Lot 4, Leyda Valley 2016 (CHILE) Waterkloof Sauvignon Blanc 2017. Next post: Wine and social media: goodbye medium+ acidity?